This indulgent mac ‘n’ cheese is a substantial standalone meal - or serve with slow-cooked or roast meat dishes. For the macaroni cheese, preheat the grill to its highest setting. Cook the macaroni in a large saucepan of salted, boiling water according to the packet instructions. Meanwhile, in a separate saucepan, heat the butter until melted, then whisk in the flour until smooth and cook for 1-2 minutes, or until pale golden-brown. Whisk in the milk a little at a time, waiting until the mixture has thickened after each addition before adding any more and whisking continually. After all of the milk has been added to the mixture, you should have a smooth sauce with the consistency of double cream. Add all of the blue cheese, 100g/3½oz of the cheddar and all of the Caerphilly to the sauce and heat gently, stirring all the time, until it has melted. Season, to taste, with salt, freshly ground black pepper and nutmeg. Drain the cooked pasta and tip it into the pan containing the cheese sauce. Stir well to coat the pasta. Set aside. Dry-fry the chopped pancetta in a frying pan over a high heat until golden-brown and crisp. Stir it into the macaroni cheese mixture. Transfer the macaroni cheese to a large ovenproof dish and top with the chopped mozzarella, breadcrumbs, and Parmesan. Grill for 2-3 minutes, or until the topping is golden-brown and bubbling. Meanwhile, for the salad, in a bowl, whisk together the mustard, vinegar and olive oil, then season, to taste, with salt and freshly ground black pepper. Add the lettuce and mix to coat it in the dressing. 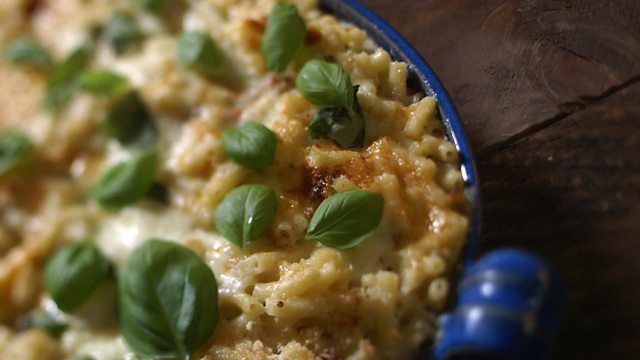 Serve the macaroni cheese with the salad alongside, sprinkled with the chopped basil.